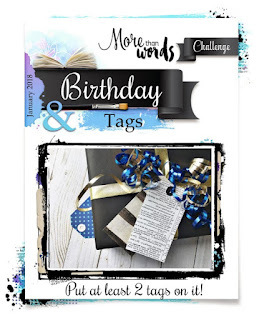 so today I would like to share my recent mixed media project which I made for More Than Words January main Challenge "Birthday & Tags"(Link Here). Birthday means Celebration, you can never be too old to celebrate your birthday. I was inspired by colorful birthday greeting cards. I want to create colorful birthday party celebration on my paper so I used all this cut out from old birthday greeting cards, so that way I am able to reuse the cards and forwarding the wishes. Birthday means balloons, gifts, flowers, lights, cake and lots of fun with celebration. I used three name tags on my projects. I found this Beautiful Photograph of twins babies from HUMAN'S OF NEWYORK by Brandon Stanton. Here is my video Tutorial for it. I hope it will helpful for you. Thank you so much for reading my blog. I really appreciate your comments..
wish you a very happy new year, 2018. I love the bright fresh colours that you have used. Gorgeous. Thank you for playing .along with our More than Words Challenge. Oh my - I adore the colours in this! SUch a clever idea to recycle birthday cards too! Great to see you at More Than Words. Oh this is just perfect! I love it! Thank you for playing along with us at More Than Words! Remember that in order to be eligible to win a prize, you have to also include a link to our blog or challenge post in your blog post. Make sure to add it in before the end of the month to not miss out on your chance to win! Thank you so much for noticing that. I will add the link, right now. A creative and beautiful page. Loved watching your video and how you put it all together. A great idea to reuse all the cards. Thanks for playing along and for sharing with us at More Than Words. Fabulous what a beautiful and cheerful take on the challenge. Thank you so much for joining us at More than Words this month.